From Havelock Col climb good rock slabs and minor snow along the ridge to the summit. Follow Agnes Stream to Disappointment Saddle and climb the snow slope, which merges with a steep snow arête leading to the final rock ridge. A schrund extending from bluffs under the east ridge of Outram Peak across to an icefall just south of Schrund Peak can completely cut off the col between Outram and Schrund peaks, but may be negotiable early in a heavy snow season. Instead, from Disappointment Saddle sidle across snow slopes to the col south-west of Quoin Peak and traverse the glacier on the northern side of Schrund Peak, then follow the rock ridge to the top. 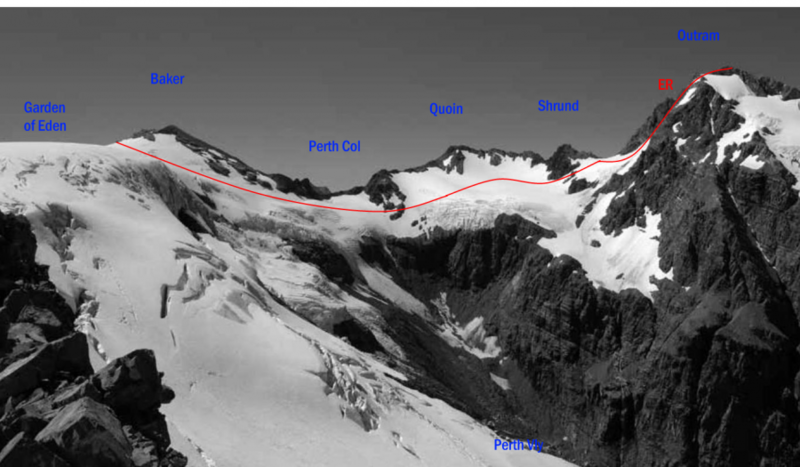 An alternative involves climbing the broad, crevassed southern aspects of Schrund Peak and dropping down to the col, and reaching the East Ridge from there. In good conditions this route offers a good transalpine crossing from the Havelock to the Garden of Eden.